Best Stay Hostel offers our guests from all around the world cozy, homely and friendly hostel with service mind. We will be great place to start your good day and your stay in Phuket. Our rooms are all new and fresh with balcony each floor. We offer different types of rooms, for individuals, backpackers, school groups, couples or families and so far we can accommodate 26 persons. 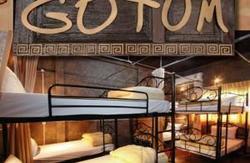 There are 2 dormitories and 4 private rooms. The highlight at backyard for chill out with cold beer! Also the living area with 48â€ LED screens to cater for sports fans. What makes us different from other hostels in Phuket, is that we have the best location and best prices, and of course BEST STAY! We are located in the heart of Phuket Old Town surrounded by charming Sino-Portugese colonial style architectures, which is one of Phuketâ€™s unique identities.Also art galleries and in-style cafÃ© around us. Just 10 minutes walk from local bus station and 5 minutes drive from airport bus station. Best Stay Hostel is situated in Phuket Old Town, nearby the clock tower on Phang Nga Road. The stunning beaches which are still only 20 minutes away. ?From our central location it is easy to get around town by foot and there are local bus services across the street departing to the island's popular beaches for a day of basking under the sun. The bus terminal is 10 minutes away and the international airport is half an hour drive from the hotel providing added convenience for day trips and onward travel.